Interested in Reviewing an Ergobaby on Your Blog or YouTube Channel? Interested in Blogging for Ergobaby? 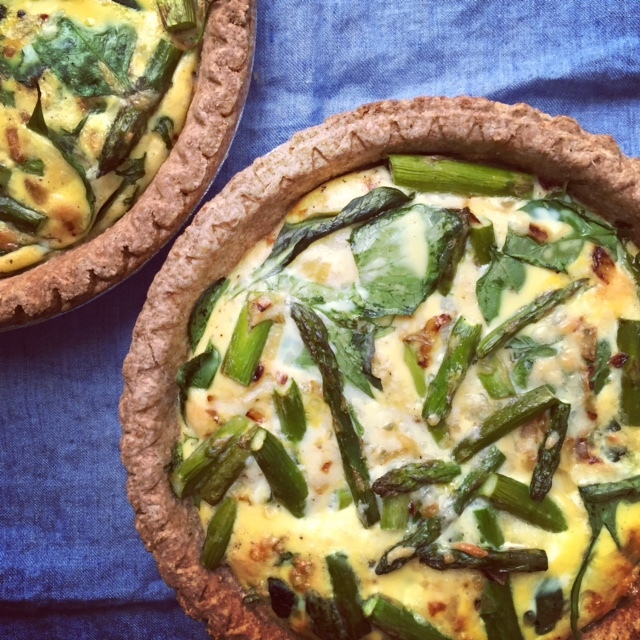 Treat mom or yourself to a bright and festive meal that celebrates spring. Don’t feel like you need to make all the dishes—pick two or three and enjoy with all the special women in your life. 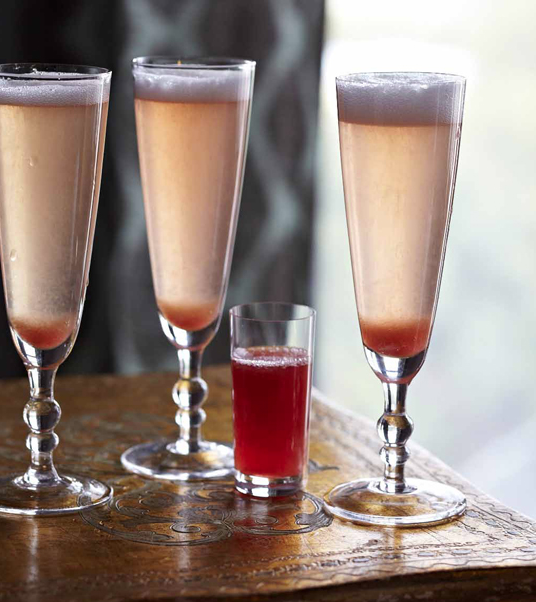 Pour the rhubarb syrup into a Champagne flute. Add the St. Germain and slowly pour in the prosecco or cava. Toast to Mother’s Day! 1. In a medium saucepan, combine all of the ingredients. Add 11⁄4 cups (300ml) of water and bring to a boil over high heat, stirring occasionally. Reduce to a simmer and cook until the syrup is bright red and the fruit has fallen apart, about 5 minutes. 2. Pour the syrup through a fine-mesh sieve, catching the strained syrup in a bowl below. (The fruit can be discarded or eaten—I hate to waste!) Allow the syrup to cool and then transfer it to a clean glass jar with a tightly fitting lid. Refrigerate for up to 2 weeks. 1. Preheat the oven to 325°F (163°C). Butter a 9-inch (23cm) pie dish and sprinkle with 1 teaspoon of the sugar. 2. Place the apricots, cut side down, in a shallow bowl and pour the liqueur and almond extract over top. Set aside. 3. In a medium bowl, whisk together the remaining 1⁄3 cup (65g) sugar and the eggs. Fold in the flour and salt, and then the melted butter, milk, and vanilla. 4. Arrange the apricots in a circular pattern in the prepared pie dish and then gently pour the batter over the fruit pieces. Sprinkle the almonds evenly on top and bake for 50 to 55 minutes, until lightly golden and set. Cut into 6 wedges and serve. 1. In a small bowl, whisk together the oil, vinegar, peach or apricot nectar, salt, and pepper. Set aside. 2. Onto each of 4 salad plates, place 11⁄2 cups of the greens, 3 nectarine slices, 2 tablespoons of the ricotta, and 1 tablespoon of the basil leaves. Drizzle each salad with 11⁄4 tablespoons of the vinaigrette, sprinkle with 1 tablespoon of pistachios, and serve. but I recommend you look for fresh ricotta at the cheese counter or at your farmer’s market. Fresh ricotta is creamier and has a richer flavor than commercially produced cheese. 2. Sprinkle the Parmesan over the bottom of the pie shell; set aside. 3. In a large bowl, whisk the eggs together. Add the milk, salt, pepper, cheese, and quinoa and whisk again. Stir in the sausage. Pour the egg mixture into the pie shell. Add the cherry tomatoes to the tart, distributing them evenly, and bake for 40 to 45 minutes, until the tart is set and the top is golden. Cut into 6 wedges and serve. This delicious and versatile cake can be enjoyed on its own or topped with fresh berries. And if you have any left over, it makes an incredible French toast. 1. Preheat the oven to 325°F (163°C). Grease and flour a 9-by-5-inch (23 by 12.75cm) loaf pan. Set aside. 2. Combine the flour, salt, and baking soda in a medium bowl and set aside. 3. Whisk the eggs with the sour cream and the lemon zest and juice in a medium bowl and set aside. 4. Place the butter in a large bowl and, using an electric mixer on medium speed, beat until creamy. Scrape the sides of the bowl down and add the sugar in two additions, beating until blended after each one. Add the sour cream mixture and mix. Add half of the flour mixture and mix again. Stir in the remaining flour mixture by hand. 5. Transfer the dough to the prepared pan. Bake for 65 minutes, until lightly golden on top. Let cool in the pan. Frances Largeman-Roth, RD, is a New York Times best selling author and nationally recognized health expert. Frances was the Food and Nutrition Director at Health magazine for nearly eight years. Frances is the author of Feed the Belly: The Pregnant Mom’s Healthy Eating Guide and her latest cookbook, Eating In Color: Delicious, Healthy Recipes for You and Your Family, was recently published. She lives in Brooklyn, NY, and is a mom of three. Check her website for more recipes.